To make available Dementia Success Stories initially in hard copy & continuing online. To increase awareness for capabilities in early stages of dementia, to benefit newly-diagnosed PWD, family, & professionals. 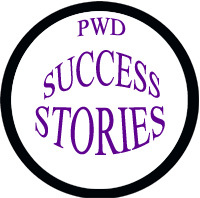 To broaden perspective of PWD, families, & professionals. To provide contact information for peer interaction. To increase application of PWD lived experiences thru including blog addresses. To distribute at big international ADI conference in Apr 2015. To make available to Alzheimers/Dementia organizations. To make available to medical professionals and other professionals dealing with dementia issues. To make available for PWD. Donation-only; NO for-profit sales !! Editorial note: Yes; my full legal name is “Truthful Loving Kindness”. This project had humble beginnings during a neurology appointment. The learned specialist exclaimed, after reviewing my comprehensive collection of medical reports, test results, and copies of lab work neatly categorized in two 3” binders, “No one with dementia could possibly prepare such complete medical folder”. Wow. CAPABLE persons cannot possibly have dementia; thanks for the encouragement! In the year since that specialist appointment, I have met many capable Persons With Dementia. The true realization just needs to be announced. “Success” can be anything from garden or craft project, to academic or dementia awareness efforts. Here is the proof that Persons With Dementia (PWD) can be capable, positive, dynamic, uplifting, motivating REAL People! Thank you to each and every one for sharing your story. If YOU have not yet, but would like to share your story please leave comment. To see each page, suggest right-click and “open in tab”. Will allow you to easily return to this index page in order to open the next page as you wish. A valuable and varied collection of stories. I read them all through this morning (despite planning on reading only one per day) and I think the lack of knowledge from primary care physician came through, as well as some lack of family support. Acceptance of chronic illness is one of the hardest things for anyone – patients or family. People (families in particular) can’t accept what they don’t understand and need to have better education. Many people want to sweep their loved ones out of the way and make them invisible. They think it’s all too hard or embarrassing to have a family member who has declining mind and/or body function. As an ICI (Invisible Chronic Illness) sufferer myself (not Alzheimers or Dementia), I just HATE the way people trivialise my intermittent cognitive function and brain fog. They don’t understand the waxing and waning of symptoms. They don’t understand how I can write a long email or blog post one day, and the next, I can barely write one sentence as the words swim around in my head. They don’t understand how I can do so much on my own (it’s much easier if I don’t have to concentrate on conversation), but shy away from social functions or regular interaction with the public. I find, in general, some of the most intelligent people say “its just ageing, everyone declines as they age” Trivialising anyone’s symptoms is so insensitive. And just because you have a degenerative or terminal disease like Dementia or Alzheimers or Cancer or whatever, doesn’t mean you’re not human and don’t have feelings.